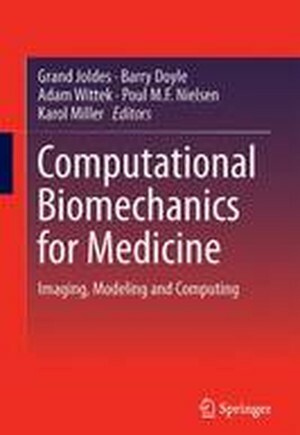 The Computational Biomechanics for Medicine titles provide an opportunity for specialists in computational biomechanics to present their latest methodologies and advancements. This volume comprises eighteen of the newest approaches and applications of computational biomechanics, from researchers in Australia, New Zealand, USA, UK, Switzerland, Scotland, France and Russia. Some of the interesting topics discussed are: tailored computational models; traumatic brain injury; soft-tissue mechanics; medical image analysis; and clinically-relevant simulations. One of the greatest challenges facing the computational engineering community is to extend the success of computational mechanics to fields outside traditional engineering, in particular to biology, the biomedical sciences, and medicine. We hope the research presented within this book series will contribute to overcoming this grand challenge. Part I: Biomechanics of Solids.- Computer Assisted Planning of Periacetabular Osteotomy with Biomechanical Optimization: Constant Thickness Cartilage Models vs. Patient-specific Cartilage Models.- Role of Ligaments in the Knee Joint Kinematic Behavior: Development and Validation of a Finite Element model.- Challenges to Validate Multi-physics Model of Liver Tumor Radiofrequency Ablation from Pre-clinical Data.- Robust Landmark Identification for Generating Subject Specific Models for Biomechanics.- Forward Problem of Time-Resolved Diffuse Optical Tomography Considering Biological Tissue Deformation.- Mechanical Models of Endothelial Mechanotransmission Based on a Population of Cells.- Investigation of Modelling Parameters for Finite Element Analysis of MR Elastography.- Fuzzy Tissue Classification for Non-linear Patient-Specific Biomechanical Models for Whole-Body Image Registration.- GPU-Based Fast Finite Element Solution for Nonlinear Anisotropic Material Behavior And Comparison of Integration Strategies.- Fast Prediction of Femoral Biomechanics Using Supervised Machine Learning and Statistical Shape Modeling.- Some Use Cases for Composite Finite Elements in Image Based Computing.- Part II: Vascular System and the Brain.- Computational Simulation of Blood Flow and Drug Transportation in a Large Vasculature.- Fundus Image Based Blood Flow Simulation of the Retinal Arteries.- Integration of an Electrophysiologically-Driven Heart Model into Three-Dimensional Haemodynamics Simulation using the CRIMSON Control Systems Framework.- Simulating Patient Specific Multiple Time-point MRIs from a Biophysical Model of Brain Deformation in Alzheimer's Disease.- Traumatic Brain Injury - an Investigation into Shear Waves Interference Effects.- Modeling of Bifurcated Tubular Structures for Vessel Segmentation.- Modelling the Presence of Diffuse Axonal Injury in Primary Phase Blast-Induced Traumatic Brain Injury.